In football, you tend to wear a lot of clothing and pads. You also tend to do a whole lot of physical exertion at a high level for a long time. This means that having overheating issues is something that you have to watch out for, especially in summer months when you’re training. Examples of medical issues you could have related to overheating include dehydration. You really can’t skimp on getting regular water during high levels of physical exertion. This often happens in the form of sweat that makes salt and water leave the body. This depletion needs to be compensated for with both water and salt, often in the form of sports drinks. The first sign that there’s a problem is often when you get cramps. This tends to especially happen I areas of the body with large muscle systems. If you are noticing a cramp in a major area like your legs, and the conditions are consistent with it being heat-related, such as high temperatures and activities that are making you sweat a lot, then you really need to take a break and replace your fluids as well as contact anyone on hand with training to avoid suffering a heat stroke. You need to go somewhere cool and rest while building your fluids back up. Once this happens, you can cautiously go back to the game or practice again, but it’s important to make sure that you pay attention to why the situation happened in the first place. Otherwise, you’ll be in danger of having that problem all over again. This might mean making sure that you take more water to games or practices, especially in situations where it’s going to be very hot, for example. Everyone’s body is different, and yours could be much more prone to water and salt problems due to the heat than other people. You can’t just rely on what they’re doing since they might be able to stand in the heat for hours with no deleterious effects, whereas you may need many more water breaks and breaks away from the heat and with help from ice to cool off. Concussions are common to all football positions. Obviously, they are going to be more common to linemen, linebackers, and other players who explicitly play for contact. But, it’s also true that anyone on the field could be hit, including quarterbacks and wide receivers. If you think you might have a concussion, you should look for the signs. These are having issues staying balanced on your feet, feeling tired, having a numbness or tingling sensations, blurriness in your vision, or any other mental issue, then you should definitely go get checked out. One important way to avoid concussions if you’ve had them before is to make sure that you keep your head up when performing a tackle. You shouldn’t lead with your head because this is often the source of head-related injuries such as concussions. Obviously, this sort of injury cause is going to apply in particular to those who are playing linebackers and other positions on the defensive side that require a lot of tackling. Coming back from concussions can be difficult because this is the nature of head injuries. As a result, it’s far easier to do everything you can to avoid incurring any such injuries in the first place. Other examples of serious injuries you can incur while playing football includes getting injuries to joints like your knees. 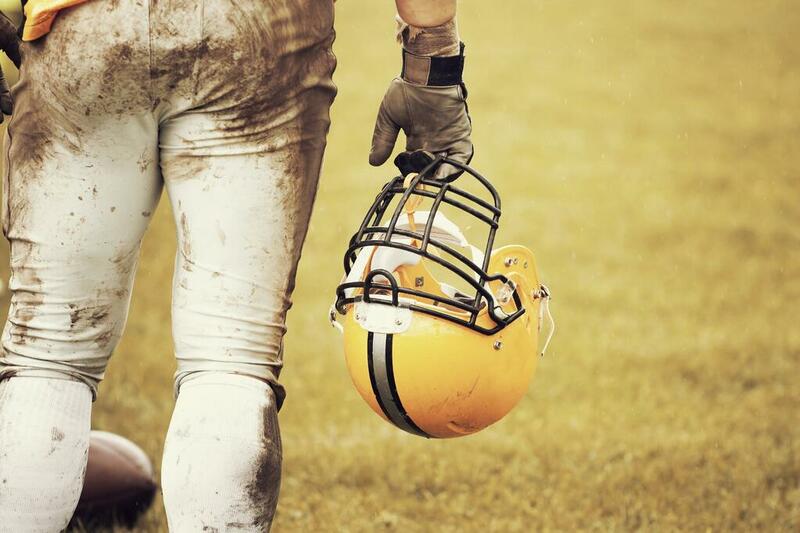 In fact, traumatic knee injuries are some of the more common types that happen on the field. In particular, it’s common to end up with ACL damage and damage to the cartilage in your knee. It’s important to be particularly careful about injuries to your knees since you can end up having your career or ability to play football for fun severely limited if you damage your knees enough. It’s also common to end up with sprained ankles because of the loose terrain you often play football on, which can lead to your ankle moving too much. If sprains are an issue for you, it’s important to wrap them in order to make sure the ankle only moves in the way it should. A torn hamstring is another common football injury. These often occur because you go from being stationary to running as hard and as fast as you can. That sudden burst can cause problems with your hamstring. That’s why it’s especially important to make sure you stretch out properly and thoroughly before any kind of athletic activity. It’s also why it’s important to notice any kind of pain or strain in that area so you can take it easier with the sudden running. When it comes to a lot of physical contact, especially in terms of tackling opposing players, shoulder injuries are common. This leads to shoulder separation and dislocation. In particular, any kind of hard contact below the shoulder can make the joint separate. If the dislocation is minor or more of a strain and less of a full dislocation, resting, elevating, cooling and compressing the shoulder to prevent any further injury could be enough on its own. Any position player that does a lot of running or jumping could incur injuries to toes. One common such injury in football is known as “turf toe.” This is when the base of your big toe becomes damaged. It’s especially common when running over harder surfaces. If you have pain in your big toe and you do a lot of running and jumping as a wide receiver or other position that has this problem, then it’s important you get it checked out before it can get worse. It’s also important to take care of it with compresses if you’re just strained in order to prevent it from progressing. The tendon behind the ankle can become inflamed and irritated due to overuse or poor use during a game or practice. It’s actually common in just about any activity that involves any kind of strenuous running. The thing about it, though, it that it’s largely preventable. The key is to make sure that your Achilles' tendon is stretched properly so that it doesn’t gain tiny tears due to stretching it too far. It’s also true that the older you are, the more susceptible you’ll be to tendonitis in the Achilles' tendon. This means that vigilance regarding what you feel in your body is especially important. Overall, it’s important to be cautious when dealing with football injuries since they can be some of the most serious kinds in all of sports, given the types of activities you tend to engage in during the sport. For more information about the topic of sports medicine and other related topics, please don’t hesitate to contact us today.